Is this poster still cool? Or is it just a fad that's on it's way out? The print became absurdly trendy, but I think the message is timeless. I still love it. It is quite trendy, but I have found a lot of things I have loved for a long time- like some fabrics, prints, etc. have become SOOOO trendy. But the way I see it is if I really love it and will love it long after the trend is gone then I go for it! So, if you love it then get it! still cool - i love mine!! It was cute until I saw it EVERYWHERE. Some things are timeless, but I don't think this is one of them. It just seems unoriginal now. I think that saying will be in forever! Only because it's totally necessary of course. Order it up and put it on the wall with the new fabulous color. p.s. i think it looks great! I still love it. I say go for it if you like it. The key is in how you frame it in my opinion. I loved it at first, but am now a little tired of it. you could create you own piece with a new fun saying on it and it will feel a little more personalized! Its a little overexposed but I still like it. Vintage never goes out of style if you ask me. Particularily like the original one. I think the newer knock offs of the poster are the ones that are faddish. Same goes for the ones that say something different but knock off the design. I still like it...but isn't a drag when something YOU love becomes something everyone ELSE loves?! Still like it too. And I'm not a big fan of the knock-offs either. i have one. although i feel like the whole "saying poster" is kinda tired, not just this one. but i still like it nonetheless. I have a pink one and I like it. Sure, it's tired. But nothing's tired if you looove it. I LOVE them! I think they are so fun and has a great message. very trendy but a classic. I have it in my office at work and on stressful days it's a nice reminder! I think it is a classic. I mean it's trendy but it's not. It's actually very historic. I also think it's not about whether it's cool or not. If it's going in your space then it's about what you like. Oh, I am so tired of looking at that thing. Great message, agreed but I wish it were not so decor- homogenized. I think that if you love it, who cares?! I agree with Jennifer... I think if you really will love it whether it's considered "in" or "out" then you should go for it. I wouldn't get one personally, bcause I hadn't heard of them until I started seeing them everywhere, so I would really just be be following a trend. But if you saw it & loved it right away then go for it!! I still really like it and have it on my shopping list. When I have kids, I plan to hang one on the nursery door as a reminder to take a chill pill before addressing the screaming child. If that doesn't happen, I'll hang it in my entryway on the door headed to the garage, so I see the message every time I leave for work! Since there's a great history behind it, it's classic. The trendy-ish knockoff prints makes it too faddy, for my taste. I have it, in my revamped basement laundry, in matte black vinyl on pure white walls. It's in an obscure spot and simplistic. It's also a FABULOUS reminder for me since it's above my sewing/craft/embroidery table!! I am not a "letters on the wall" kinda gal, but this works for me. It still hangs with pride in my kitchen. I love the history behind it and the message is always great to keep in mind. If you love it, then who cares what the trendmeisters say! 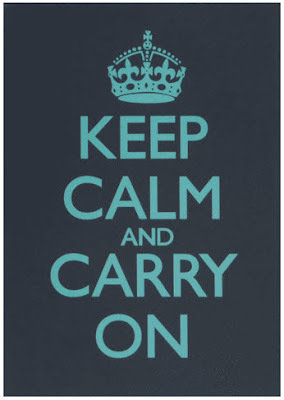 I've also seen one that says "Keep Calm and Carry a Cupcake" That works for me, too! I love it regardless of whether or not it is hip. I have it in my cubicle at work. I have disasters in my research often, and this helps me move on.